It’s Week 13 and the bye weeks are over. Week twelve was dominated by some familiar names and some under-used players. Last week’s top lineup would have included Baker Mayfield, LeGarrette Blount, Kenyan Drake, Amari Cooper, David Moore, and Vernon Davis. If you had these six in your starting lineup, you likely won your Week 12 match-up. For Week 13, Joe Flacco, Marlon Mack, DeSean Jackson, and Kenyan Drake, among others, may not be available this week for fantasy football team owners. Your fantasy football waiver wire should still be filled with some quality players if you need the help. Last week, we advised to be cautious of adding Chargers tight end Antonio Gates and Lions running back LeGarrette Blount. As to the latter, the Lions made it apparent that they were interested in pounding the football through Blount (not Zenner) whenever they could. Blount finished with 20 touches for 103 all-purpose yards and two touchdowns. As for Antonio Gates, his Week 12 performance looked every bit of the fluke as he had just one reception for 18 yards in Week 13. If you’re looking to add a player, it’s because of a significant injury or because your player is underperforming or because a team is going in a different direction in using its personnel. We’ll list extra players you can consider if your waiver wire is thin. There are plenty of options at quarterback for fantasy football team owners as these quarterbacks are available in over half or near all of leagues. The Cowboys Dak Prescott carved up the Lions pass defense for 289 yards and two passing touchdowns and added a rushing touchdown for good measure. Thursday night, the Cowboys play a Saints defense in a game that should evolve into a shootout. He’s got a solid schedule for the remainder of the season. Jameis Winston dialed up his best game of the season in Week 12 throwing for 312 yards and two touchdowns on 29 for 38 passing. The Buccaneers play the Panthers and Saints in the next two weeks. 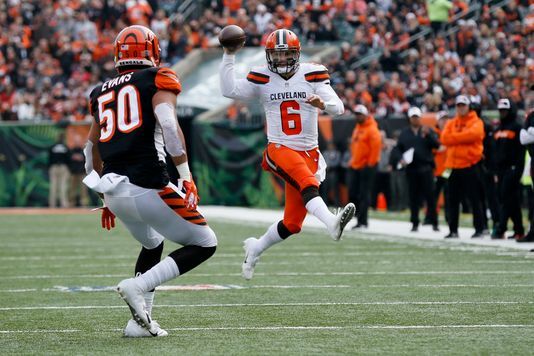 Rookie Baker Mayfield threw multiple touchdowns for a fifth game in a row and it was his best fantasy football game of the season finishing tops in fantasy leagues with 258 yards and four pass touchdowns against an imploding Bengals pass defense. This week’s opponent, the Texans, will be tougher. Mayfield gets the Panthers in Weeks 14 and the Bengals in Week 16. Ravens Lamar Jackson improved in his second start going 14 for 25 for 178 yards passing and tacked on 71 yards rushing. He had two total touchdowns on the day. He could get another start this week against a Falcons pass defense that struggled against the Saints last week. Both Case Keenum and Derek Carr are worth a look this week if your waiver wire is thin. Keenum gets a Bengals defense that seems to be disintegrating and Carr gets a pliable Chiefs pass defense. Keenum is ranked ahead of Carr because of the better quality of receivers the Broncos have. This week, there’s a little bit of everything on the waiver wire for fantasy football team owners. There are starters like Gus Edwards and Josh Adams, injury replacements like Austin Ekeler and Frank Gore, and handcuffs like Malcolm Brown and Justin Jackson. With the fantasy football playoffs beginning in a week for most, you shouldn’t be in the mix for a running back off the waiver wire unless you are desperate or have room on your bench to take a chance on a player. Give these running backs a look if you need help. The running backs with a longer view or higher touch rate are ranked higher. The Eagles Josh Adams and the Ravens Gus Edwards are your top waiver adds if available as they are in over three of every ten leagues. Each touched the football 22 and 23 times, respectively, last week and both are expected to remain their team’s primary running backs. Austin Ekeler will be filling in for the injured Melvin Gordon (MCL sprain) possibly for the remainder of the season. If that is the case, Justin Jackson will also see a bigger role in the offense. Ekeler is available in thirty percent of leagues and would get touches from between 18 to 22 times per game. The Buccaneers Peyton Barber has had back-to-back weeks of 18 rushes per game and was fantasy football relevant each week. He’s got a great match-up this week against a leaky Panthers defense. As mentioned above, LeGarrette Blount will likely continue receiving a majority of touches so long as Kerryon Johnson is out. Even when Johnson gets back, Blount should have a decent workload, albeit at a reduced level, as the Lions continue to pound the football with their passing game struggling. After Blount, there are injury fill-ins and a suspension fill-in for this week: Frank Gore, Nyheim Hines, TJ Yeldon, and Carlos Hyde. Your level of needing a pick-up-and-play will dictate whether these players appeal to you. Frank Gore does have a great match-up against a leaky Bills rush defense. Rex Burkhead is a bench stash since we don’t know what his role will be exactly especially coming off a neck-injury. Doug Martin and Jalen Richard have a favorable match-up against the Chiefs. Ty Montgomery (eleven touches) and Theo Riddick (nine touches) would be solid pick-ups in deeper leagues, especially PPR leagues. Over his last two games, DJ Moore has hauled in 15 receptions on 17 targets for 248 yards and one touchdown. He should be rostered in most fantasy football leagues given the favorable passing schedule the Panthers have on tap. Moore is still available on three of every ten waiver wires. With DeSean Jackson out until further notice and O.J. Howard on injured reserve, receivers Adam Humphries and Chris Godwin need to be rostered in all leagues. Both have similar stats on the season, but it’s Humphries who’s been a touchdown hawk, with four in the past four games. The Cardinals Christian Kirk is another player that should be rostered in most fantasy football leagues given the favorable passing schedule the Cardinals have. Kirk is available on two-thirds of fantasy football waiver wires. The Cardinals remaining schedule favors the passing game. Josh Doctson is back in the mix with a new quarterback under center. The yardage has been underwhelming (49 YPG) but he’s nine of 17 over his last two games. Given his usage, the touchdowns should come. A last minute Week 12 TFG deep sleeper, Bruce Ellington is 12 of 16 for 80 yards over his first two games with his new team, the Lions. With Marvin Jones out for the season, Ellington becomes the team’s new No. 2 wide receiver. The big plays and scores will come. With Marquise Goodwin out and defenses focusing their efforts to stop George Kittle, Dante Pettis made the most of it going four-for-seven for 77 yards and a touchdown. John Ross has scored a touchdown in three games in a row and posted double digit fantasy football points in PPR leagues. As long as AJ Green is out, he’s a solid option in deeper 16 team leagues. With all the injuries to the position over the last few weeks, there are some options at tight end. Jonnu Smith has emerged as a part of the Titans offense over the past four games catching 13 of 15 passes to him for 185 yards and three touchdowns. He’s a regular part of the offense now and worth a waiver wire pick-up with favorable match-ups coming up. The Jets Chris Herndon continues to impress. Over the last three games, he’s 14 of 15 for 153 yards but zero touchdowns. In the prevous three games, however, he scored a touchdown in each game. Herndon is a solid option in deeper leagues.